After three lean years, our oak trees finally produced a bumper crop of acorns last September. Forewarned by hordes of blue jays screaming from the treetops as they plucked ripe acorns from the oaks, I had to be careful on our steep trails not to slide on the fallen nuts that were more hazardous than marbles. Dr. Warren G. Abrahamson, a Bucknell University professor who conducted a long term study of acorn production from 1969 to 1996 with Jim Layne of the Archbald Biological Station in Florida, agrees, although he says that “the production of acorns definitely is not forecasting but hind casting the weather.” In their September 2003 report of their work they claimed that the size of the acorn crop each year is partly controlled by precipitation which affects acorns during different stages of development in prior years. Other experts think that the group behavior of masting trees called synchrony most likely depends in part on the temperature during pollination in late April or May. Since oaks are wind-pollinated, meaning the wind must transfer pollen from staminate (male) to pistillate (female) flowers, a period of rain might disrupt the process. For instance, a cold, wet spring in 2012 affected red oak production in 2013 because all the oaks in the black oak group (those with pointed lobes on their leaves) take two years to mature. Those in the white oak group (those with smooth lobes on their leaves) take only a year and would be affected by a late spring frost during pollination. Still others believe that synchrony occurs as a way to outsmart nut predators by producing more nuts than the predators can eat, ensuring that at least some nuts will grow into trees. But whatever the causes, it is cyclic and occurs every three to five years. On our dry mountaintop we have mostly chestnut oaks with an occasional white oak in the white oak group. Deer prefer these tastier acorns and squirrels eat them almost immediately because they spoil more quickly than those in the black oak group, which include scrub, black, northern red, and scarlet oaks here. Those acorns the squirrels store. Acorns are not the only hard mast fruit. Others include the squirrels’ favorite—hickories, especially pignut, mockernut, and shagbark—which consists of 10 to 25 % of their diets in a good year and ripen before acorns. But like oaks, as well as the other hard mast producers—American beeches and black walnuts—they are also wind-pollinated. Hard mast is high in fat, carbohydrates, and protein and is important to at least 180 species of birds and animals in fall and winter, but since it is highly variable in production from year to year, wildlife must depend also on a wide variety of soft mast throughout spring, summer, and fall. These fleshy, perishable fruits high in sugar, vitamins, and carbohydrates include a wide variety of native trees, shrubs, and woody vine species. Foresters and wildlife biologists, in fact, consider mast to be the woody plant fruits and browse of native trees, shrubs and vines even though the word mast comes from the Old English “maest” which meant the forest tree nuts on the ground that fattened domestic pigs and other animals. A wide variety of soft mast allows many mammals and birds to survive the lean years of hard mast. Of course, there are always some nuts every year, but ever since the extinction of American chestnut trees which, because they were insect-pollinated and didn’t bloom until summer, reliably produced an excellent crop of nuts, wildlife has had to adjust to a feast or near famine hard mast situation. Consequently, encouraging biologically diverse meadows and forests, stocked with native trees, shrubs, and woody vine species produces food for wildlife throughout the year. And diverse food leads to diverse wildlife, as we’ve discovered on our property. Other examples of trees that are insect-pollinated and produce a huge number of seeds every year as well as foliage, twigs and bark are red and striped maples. Striped maple, also called moosewood or goosefoot, has fruit that matures in early fall and is eaten by ruffed grouse, rodents, and songbirds. In addition, it produces browse for deer and bark for rabbits and beaver. Elk eat the buds, foliate, twigs and bark of red maple, songbirds gorge on the seeds, and squirrels and mice store them for winter. Basswood is another insect-pollinated tree, producing seeds squirrels and chipmunks consume while deer and rabbits browse its foliage. The best of the soft mass fruit is that of wild black cherry trees. It fruits abundantly every third or fourth year in August and is pollinated by solitary bees. Seventy bird species feed on the fruit including grouse and wild turkeys. Black bears, raccoons, foxes, rabbits, squirrels, chipmunks and mice relish the dark cherries. The fruit of sassafras trees, which is high in fat, is eaten by turkeys, bobwhite quail, black bears, pileated woodpeckers and gray catbirds. Rabbits and deer browse its twigs, black bears like its stems and deer its leaves. Despite its popularity, we have many sassafras trees in our forest. Common witch-hazel, which flowers in late fall, develops woody capsules the following spring and summer. Those capsules contain a pair of shiny, black hard-coated seeds that shoot out in autumn before the next flowering. But squirrels, turkeys, quail, and grouse go after them, especially if the acorn crop fails. Deer browse heavily on witch-hazel, but it persists in growing above the deer line here. Common spicebush (my personal favorite) produces brilliant spicy red fruits eaten by grouse, pheasants, and quail. It also provides shoots for rabbits and browse for deer, but it too survives and thrives, especially in wet areas along our stream. Our son Dave has planted it as an attractive shrub in our yard and his. Both red-berried elder, which blooms the same time as the invasive barberry, has red berries available for birds in June or early July, although it only lives on steep slopes here because deer are fond of its browse. Deer also like common elderberry. It blooms in late June or early July and hangs heavy with clusters of dark purple berries favored by birds and humans in late August. Staghorn sumac is making a recovery on our property, living on the sunny edges of meadows and forests. Blooming in late June and early July, its greenish-yellow, fragrant flowers morph into bright red, cone-shaped clusters of fruit that last through the winter, providing food for squirrels, songbirds, grouse, pheasants, turkeys and quail. Deer and rabbits browse on this shrub as well. Wild berries are a popular summer food. First come the lowbush blueberries as early as mid-June on our powerline right-of-way, followed by the huckleberries. Black bears are particularly fond of them, but so are songbirds, grouse, chipmunks, pheasants, and mice. Black raspberries ripen in early July and blackberries in early August. Both are incredibly important fruit for songbirds, skunks, opossums, foxes, squirrels, chipmunks, and black bears, while rabbits like their cover and rabbits and deer browse on their stems. Of course, the wildlife must also compete with me, especially in the blackberry patches. Greenbrier of several species has bluish-black berries eaten by songbirds and gamebirds and deer browse them. They browse wild grapevines too, but wild grapes are among the most important and valuable food for wildlife including songbirds, gamebirds, foxes, skunks, raccoons, opossums, squirrels and deer. The vines provide winter shelter for animals and birds too. I remember one winter when the hard mast failed and deer spent the season among the grapevines of the Far Field thicket, yarding up like they do in northern New England. My list of native trees, shrubs and vines could be greatly expanded. In other parts of Pennsylvania, particularly south of us, still other wildlife food, such as common papaws, are important. But diversity remains the key to providing abundant wildlife food, even in years when hard mast is scarce. On a cool, breezy day in late July, my husband Bruce and I decided to hike on Green Springs Trail. Following precise directions from our friend, Ruby Becker, we drove up the Allegheny Front, locally known as Wopsononock Mountain, on Wopsy Road, seven miles beyond the Penn State Altoona campus and parked in a State Game Lands #108 parking area. 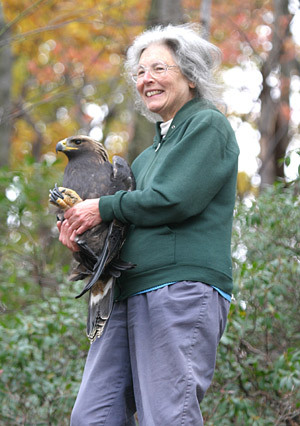 Since it was a seven-mile hike, and we are in our seventies, we planned only to hike the first portion, which our son, Dave, who had hiked the trail back in the spring with Juniata Valley Audubon Society members, said was the best part of the hike. But we hadn’t counted on the seductive beauty of this trail. After a short walk on a gated road lined with a hedge of elderberry shrubs on one side and a bog on the other, we crossed a bridge over Tub Run and entered a mature second growth, mixed deciduous and coniferous forest. Most impressive were the healthy hemlock trees with not a sign of the hemlock woolly adelgid infestation. We followed a footpath through a tunnel of huge rhododendrons, many of which were still blooming. Black-throated green warblers sang “trees, trees, beautiful trees,” expressing our feelings for the impressive hemlocks. The ground was a boggy sponge on either side of the trail and mossy hummocks provided habitat for a wide diversity of spring wildflowers, their leaves evidence that if we returned next spring, we would see blooming painted trilliums, starflowers, Canada mayflowers, Indian cucumber-roots, and trailing arbutus, among others. Beds of partridgeberry and a potpourri of club moss species, as well as lady ferns and cinnamon ferns also favored the wet ground while clumps of white Indian pipes lit up the dark understory. In addition to black-throated green warblers, occasionally we heard the singing of the brilliant red and black male scarlet tanagers, the persistent red-eyed vireos, and twice a black-throated blue warbler. But a succession of ethereal hermit thrushes provided a continuous choir of music that followed us throughout the five miles of the hike within the forest. Once a hermit thrush and hooded warbler sang at the same time in an unintentional duet. As we penetrated deeper into the forest, Bruce, armed with a map and compass, kept asking me if I wanted to turn back. He knew that I hate to retrace my steps, and I knew that the complete trail was circular, which is my favorite kind of trail. Furthermore, unlike our hilly home grounds in the ridge-and-valley, this trail was almost flat in an area aptly named Pancake Flats and thus was much easier than I had expected. For that reason, I saw no reason to turn around. Eventually, the trail became rocky, and below us we could hear the gurgle of Green Springs Run. On the woods’ floor were several huge flat rocks with rugs of moss and an understory of wood ferns. Dark-eyed juncos scolded us, and an eastern towhee exhorted us to “Drink your tea.” At last we had a view of Green Springs Run through the hemlocks and rhododendrons and descended to a bridge of large boulders that crossed the water. We emerged out on to a grassy flat area that was, in reality, an overgrown road. As Bruce moved to examine the taller grasses on the opposite side of the road, he heard the unmistakable rattle of a timber rattlesnake. Although we stayed on the road edge and searched with our eyes to see the elusive reptile, we never did see the creature, but it rattled whenever we approached the underbrush. Finally, we took the hint and plunged back into the deep forest following Green Springs Run along the cleared footpath. Beside the trail we spotted a pile of feathers—an indication that a predator had found its prey. A rock that had been wrenched out of the ground was evidence that a black bear had been searching for ants. We also paused to admire an enormous white pine beside the trail. We stopped to picnic next to a picturesque small waterfall under a welcoming hemlock tree and then continued on through a forest with many young hemlocks and a nice stand of mountain laurel beneath the larger trees. Apparently, the leaf fungus that has killed many of our mountain laurel shrubs had not reached this game lands. Cinnamon ferns and unfortunately also the invasive Japanese stiltgrass formed a portion of the understory. But I was delighted to find blooming dewdrops, also known by its genus name Dalibarda. Still another common name is star-violet because its leaves resemble those of violets, but its single, white, five-petaled flowers do not look like violets. In fact, this lover of bogs, peaty barrens and cool, mossy woods is a northern flower that grows at higher elevations on the Allegheny Front, according to Ann Fowler Rhoads and Timothy A. Block in their definitive book The Plants of Pennsylvania. In addition, I noticed the three-leaf, clover-like leaves of northern wood-sorrel, another five-petaled, white flower, that one with pink veins, which lives in the same habitat as dewdrops in Pennsylvania. The last two miles of the trail were on the gated road. Even though the foot trail looked heavily used, we had seen no one on it, perhaps because we were there on a weekday. But on the road we did see a few people walking past us near the middle of the afternoon. The trail was also remarkably trash-free except for an upright balloon caught on a sapling, wishing a happy birthday to a one-year-old, that had floated in from who knew where. Billed as “biodegradable” balloons, they still can be ingested by wildlife and last for years. We know this because often we find them on our mountain land above Tyrone, especially after their St. Patrick’s Day celebration when they release 3,000 balloons. We learned years ago that whatever pollution is released in the air eventually returns to earth and the same is true of balloons. The sunny, open road, in contrast to the dark forest, where we saw only a couple common wood nymph butterflies, was a haven for butterflies—great-spangled fritillaries, spicebush swallowtails, common sulphurs, red-spotted purples, and tiger swallowtails. Common and tall milkweed provided nectar for the butterflies, but sadly we saw no monarch butterflies, despite their milkweed food source. It had been a terrible year for monarchs, and I had seen not a single one on our property despite abundant milkweed in our First and Far fields. Much later we learned that the population of migrating monarchs in their Mexican winter quarters had been reduced by 80%, an appallingly low number. Not only are their wintering trees being illegally logged in the Mexican mountains, but herbicides, such as glyphosate, used by industrial agriculture in our country, are killing off native milkweed species, the only plants on which the monarchs lay their eggs. So we applauded the managers of this state game lands for providing food and habitat for this rapidly declining butterfly. The healthy forest and wetland also provide food and habitat for a wide range of birds and mammals. Best of all, from our standpoint, is that this enormous game land provides a refuge for those of us who appreciate wild Pennsylvania. After twelve years, the first mayapples bloomed inside our three-acre deer exclosure. Almost as soon as we put the fence up in March 2001, mayapple leaves popped up in the lower, wet, wooded section of the exclosure. But they were single leaves, not the double leaves with a notch in the middle from which a single, six-petaled, waxy, white flower would emerge. Last spring on our mountain the first umbrella-shaped mayapple leaves unfurled on March 30, by far the earliest date ever for this wildflower that often doesn’t flower until the second week in May. The frosts of April didn’t wilt the leaves, and on the 18th of April, I found three double-leaved mayapples in the exclosure, each bearing a large flower bud. The exclosure isn’t the only place mayapples bloom. These clonal plants have formed large colonies beside our road, along Sapsucker Ridge Trail, and beside the Far Field Road. But the largest colony of all covers more than an acre at the Far Field thicket. One leaf even appeared in the middle of the Far Field last spring, but I doubt it will make much headway against the goldenrod and asters. As usual the first mayapples bloomed along the Far Field Road on April 27, the earliest blooming date ever during our 40 years here, but those mayapples beside our access road didn’t flower until May 1, right in time for May Day. While the first part of its common name refers to the month it usually flowers in, the “apple” refers to the yellow-green, egg-shaped fruit that is purported to appear in August or September after the plant has fallen down. I say purported because I’ve never actually found a fruit on any of our mayapples. 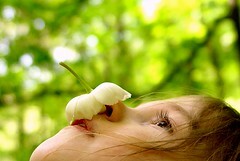 Although the deer allow our mayapples to leaf and flower, they never allow them to fruit. Or maybe the culprit is the occasional eastern box turtle that finds and devours the odd fruit. Apparently, the seeds inside the fruit must go through the gut of a box turtle in order to germinate. Even its odor was debated, and Charles F. Saunders, in his book Edible and Useful Wild Plants of the United States and Canada, describes the strong scent of the ripe fruit as a composite of cantaloupe, summer apples, and fox grapes. Gibbons writes that “I love the sweet scent of the ripe fruit with its hint of mysterious muskiness.” But all of this is hearsay as far as I’m concerned. Despite the appeal of its ripe fruit, its raw leaves and roots are poisonous. Native Americans used the plant to commit suicide and made an insecticide from it to kill corn worms. Today it is an ingredient in laxatives and is useful for the treatment of intestinal worms. But its most important use derives from its ability to produce podophyllotoxin, which is “the starting material for the semi-synthesis of the anti-cancer drugs etoposide, teniposide and etopophus,” according to Rita M. Moraes, Hemant Lata, Ebru Bedir, Muhammad Maqbool, and Kent Cushman in their paper “The American Mayapple and its Potential for Podophyllotoxin Production.” These compounds have been used to treat lung, testicular, stomach and pancreatic cancers, and some leukemias. It’s also a precursor to a new derivative called CPH 82, which may be useful for treating rheumatoid arthritis, psoriasis, and even malaria. It’s expensive for pharmaceutical companies to synthesize podophyllotoxin and originally, back in the 1970s, when its anti-cancer properties were discovered, the pharmaceutical companies used the rhizomes of our mayapple—Podophyllum peltatum—to produce podophyllotoxin. In one year they harvested more than 130 tons of American mayapple rhizomes. Then the scientists found that P. emodi, a perennial rhizomatous herb growing in the understory of Himalayan subalpine forests, contained more podophyllotoxin than P. peltatum, so during the next three decades, they switched to the roots and rhizomes of the Himalayan species. The demand by the international market for this plant quickly turned it into an endangered species. For this reason Moraes, Lata, Bedir, Maqbool, and Cushman used a different extractive method on the leaf blades of our mayapple to produce podophyllotoxin. Unlike ripping up the roots and rhizomes, which destroys the plants, leaf blades are a continually renewable resource. Then, too, our mayapple is common and grows in large colonies from northern Quebec and Minnesota to Florida and Texas and west to Nebraska. It also thrives under wide-ranging growing conditions from the low winter temperatures of the north to the high summer temperatures of the south. 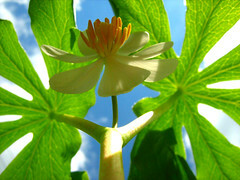 Like many spring wildflowers, mayapples reproduce both sexually and asexually. Sexually, bumblebees and other long-tongued bees cross-pollinate the flowers from one clonal colony to another, while asexually the rhizomes continually expand in dense circular clones, usually crowding out any competing vegetation. The plants are one to one and a half feet tall and consist of sterile, immature, palmate-shaped, single leaves or two to three, palmately-lobed, reproductive leaves. Both its genus name—Podophyllum—which means “foot leaf,” and its species name peltatum meaning “shield-shaped” refers to its leaves. So too do three of its common names—”umbrella leaf,” “duck’s foot,” and “Puck’s foot” (the forest fairy in A Midsummer Night’s Dream). Its medicinal uses have given it still more nicknames that need more explanation for modern readers. “American mandrake,” the most popular alternative name for mayapple, referred to one of the most powerful of Old World medicinal herbs, mandrake—Mandragora officinarum—that grows in the Mediterranean countries. Its brown root, which penetrates deep into the ground, often branches and resembles a human figure. While neither the plant nor its flower looks like our mayapple, its fruit is a large, fleshy, yellow to orange-colored berry. It was used as a sleeping pill when the sufferer was in pain or being operated on, as a remedy for depression, and as a purgative. 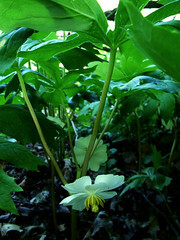 Like mayapple, the plant is poisonous. “Devil’s apple” may refer to its fruit or, more likely, to its medicinal use, because mandrake is also known as “Satan’s apple.” “Vegetable mercury” probably refers to its similar uses to dog’s mercury (Mercurialis perennis) a poisonous plant that is taken as a purgative or laxative. “Vegetable calomel,” comes from the fact that calomel was used as a purgative and as a fungicide and is also called mercurous chloride, which brings me back to the “vegetable mercury” nickname. “Wild jalop” is similarly confusing. Jalop is a Mexican morning glory used as a purgative, but wild jalop (Ipomoea pandurata), the hated bindweed, is used to treat skin diseases and as a laxative by some herbalists although again it is dangerous to overdose on. A member of the Barberry family, the mayapple genus has only four species worldwide, our own mayapple and three Asian species. It also has its own fungus—Podophyllum podophylli or the mayapple rust, which only lives and reproduces on mayapple leaves. 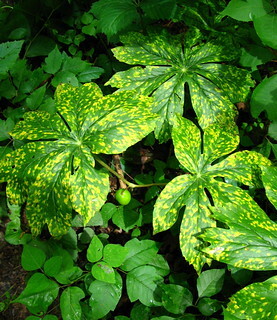 I find some of the angular, yellow spots on some mayapple leaves every spring. According to Joan Maloof in her book Among the Ancients: Adventures in the Eastern Old-Growth Forests, the life cycle of the mayapple rust is more complex than that of the mayapple itself. When the mayapple germinates, she writes, a “dark, spiky, club-shaped thing smaller than a grain of sand” also germinates in the forest soil and produces tiny spores. 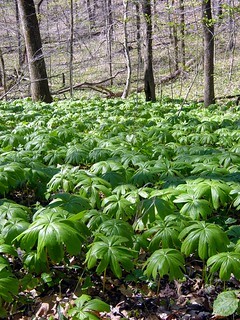 All are in search of mayapple shoots. When one spore finds a mayapple, it produces a “microscopic, threadlike filament” called a hypha, which is in search of another hypha thread made by a second hypha spore. If they find and merge successfully, they create a hypha with two nuclei in every cell instead of one. They then produce more dark, club-shaped spores which germinate and create a second generation of spores just as the mayapple leaves unfurl. Using wind and/or water, those spores are carried on to the stems and leaves of mayapples. Again the spores germinate and their hyphae look for nutrition and each other. Maloof reminds us, after her discussion of mayapple rust, that a forest is more than its trees. “And in ways we do not yet fully understand, these small things may determine the lives and deaths of trees.” And not only those of trees, but of humans too, in the case of our amazing medicinal American mayapple. Every autumn the first hard frost comes later. Back in the 1970s and early 1980s, when we were engaged in intensive gardening, we could expect a hard frost in the first week of October. Gradually, as the years passed, the hard frost date arrived in the second week. Then, in this century, it moved into the third week. And last October it finally came on October 28. Just as the date for the first hard frost has advanced year by year, so too has mild autumn weather. Instead of several days of Indian summer weather at the beginning of November, we have stretches of Indian summer weather throughout November and, last autumn, well into December. Final leaf fall is also later every year. In the seventies and even into the eighties, we could count on a brisk wind at the end of October shaking down every last leaf and leaving us with the bare branches of November. 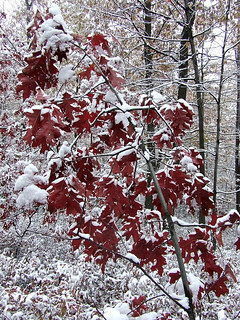 Yet despite last October’s heavy snowstorm, most of our red, black, white, chestnut and scarlet oaks held on to the majority of their leaves until the third week of November. Remembering the previous year’s mid-October snowstorm that brought down so many trees and branches overburdened with leaves and snow, I was apprehensive when I woke to snow on October 29. As the snow piled up on leaves and branches, I walked down our road, dreading to hear the sound of breaking branches, but I heard only a few. Once I picked up an oak branch, its leaves heavy with snow, and marveled at its weight. Later in the day, the thermometer slowly rose to 34 degrees. 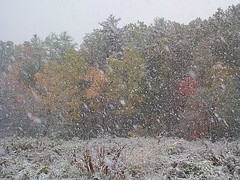 The trees dripped even as it continued snowing, but the warmth saved most of our leafy trees. The one casualty I found was a large, live, black oak along our road. But it was hollow throughout much of its trunk length and would have come down soon in any case. By November most of the snow had melted, and we finally had a couple weeks of what is normally “October’s bright, blue weather” and dazzling leaf color after a mostly soggy October. The sugar maples along the Far Field Road were still a blaze of red and gold. The coppery gold of American beeches lit up the hollow. And from Alan’s Bench, I gazed at the oaks of Laurel Ridge, which glowed reddish-gold and burnt orange. Although I saw an occasional buck during my walks, squirrels, chipmunks, and turkeys were scarce. What few acorns the oaks had produced had been plucked from their branches by blue jays weeks before. I also saw little evidence of hickory nuts. Even our black walnut yard trees hadn’t produced many nuts. After the previous year’s feast, the wildlife was faced with famine. As soon as I put my bird feeders up, in early November, they were mobbed by gray squirrels and chipmunks. The birds were not as affected even though our wild grape crop had also failed. Berry eaters, such as robins, cedar waxwings, and bluebirds still called most warm days. Carolina wrens caroled back and forth in our yard. The female tapping cardinal returned to our stairwell window. Winter wrens called and bounced up and down beside the stream. Golden-crowned kinglets foraged in the spruce grove. And, in Margaret’s Woods one day, I found dozens of singing, foraging white-throated sparrows, several dark-eyed juncos, a Carolina wren, and at least one fox sparrow in a large hedge of multiflora rose covered with bright red rose hips. Raptors, too, were plentiful. A male American kestrel sat on his favorite power pole overlooking our First Field. On a hazy warm day in late November a male northern harrier flew silently past me as I sat on Coyote Bench. Driving down our hollow road, I flushed a sharp-shinned hawk. And on Thanksgiving Day our son Steve and his wife Pam watched a barred owl swoop down on a tree branch beside the Far Field Road. Steve also saw a golden eagle migrating along Sapsucker Ridge that day. But I had the most unexpected sighting of Thanksgiving. As I circled the Far Field on Pennyroyal Trail, I flushed a hermit thrush. Never had I seen one so late in the season. 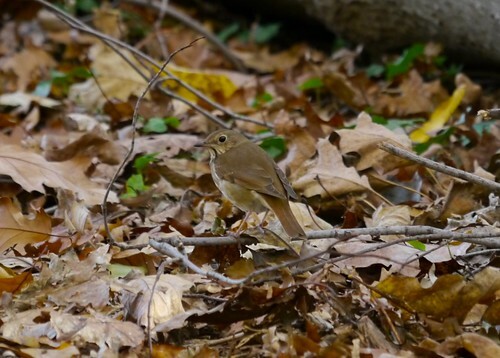 When I checked McWilliams’s and Brauning’s The Birds of Pennsylvania, it reinforced my belief that hermit thrush migration peaks during October, which is when we usually see them. By the second week in November most hermit thrushes have moved south. A few winter over at low elevations in Pennsylvania, particularly in the Piedmont area. But more surprising than my sighting occurred three days later, on a warm November 27, when our son Dave heard a singing hermit thrush on Laurel Ridge. Since we rarely hear one singing here during spring migration, we were especially surprised to hear one so late in the autumn. Whether it was the acorn failure or merely the lure of our birdseed, we had many excellent views of southern flying squirrels at our feeder area. Because it was still warm and some bears were no doubt still about, I brought in my feeders every night throughout November and December. On Thanksgiving evening I turned on the back porch light before going out to retrieve the feeders. A flying squirrel was busily scarfing up seeds on the porch floor. So intent was it that my husband Bruce was able to take several photos of the creature through the storm door. It only fled down the steps when I went out to get the feeders. My next sighting was the first of December when I watched one flying squirrel chase off another on the birdseed-covered ground below the back step. The victor continued eating, even burying most of its body beneath the grass and seeds in its quest for food. A full moon illuminated the sky on the tenth of December when Bruce startled a flying squirrel on the back porch. It zipped up the porch railing and sailed over near the juniper tree where it made a rough landing and disappeared down slope. The next evening I surprised the flying squirrel on the back porch steps, and it performed the same maneuver as it had for Bruce the previous night. 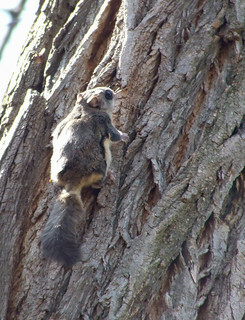 We saw at least one flying squirrel at our feeder area throughout December, and we thought it was only fair that we should feed flying squirrels at night since we hosted at least 11 gray squirrels by day. Whether or not the flying squirrels were affected by the unusual warmth, at least one woodchuck was. Below the back porch a fat male woodchuck continued to emerge from his hole every afternoon to eat the fresh greenery on the slope into December. The last time I saw him was mid afternoon on December 22, again a record breaker here for a woodchuck. Usually, they are tucked into their hibernation dens by mid-November and we don’t see any until the following February when the males are busy visiting female dens. Plants also responded to the continual warmth. Several so-called green immigrant flowers, those that came from over seas, bloomed later than I could remember. On November 27 I found a pearly everlasting (Anaphalis margaritacea) blooming beside Alan’s Bench. A member of the Composite family, it was once dried and used in making memorial wreaths and for decorating vases and wall brackets. Today it still appears in dried flower arrangements. Its small, white, globular-shaped flowers grow in clusters atop a cottony stem with thin, toothless leaves that are sage-green above and woolly-white beneath. 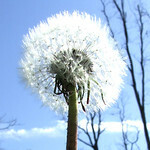 Other names for it are silverleaf, cottonweed, lady-never-fade, Indian posy and ladies’-tobacco. Since it came from Europe, Indian posy seems inappropriate and I doubt whether ladies smoked it. But they did use it for coughs and as a poultice for bruises in pioneer days. Its latest blooming month, according to Rhoads’s and Block’s The Plants of Pennsylvania, is October, which was why I was amazed to find it flowering in late November. On that same day several forsythia flowers blossomed on a scattering of branches. Forsythia originated in South China where it grew wild. The Chinese called it golden bell. Robert Fortune, a young Scot, was sent into China to collect new plants for the Royal Horticultural Society of London in 1845, three years after the Opium War, when westerners were resented and mistrusted. So Fortune, disguised as a Chinese man, dressed in native garb and wearing a pigtail, explored the South China coast with a crew of Chinese workmen in springtime. There he found the countryside filled with forsythia. Although he later named it for the second curator of London’s Chelsea Gardens—William Forsyth—who was also a Scot, golden bell is a more evocative name that was quickly forgotten. Dandelions also thrived in our driveway and during this longest autumn, I found a dandelion blooming on Butterfly Loop on December 5. It too came over with the colonists who used it as a cleansing herb and pot herb. It probably originated in Asia Minor long before anyone thought to notice it because both the Greeks and the Romans cultivated it. The Chinese called it earth nail and used its long taproot and green leaves for food and medicine while in Japan it was grown as a decorative plant. In Britain, the Celts used it for both food and wine and the Anglo-Saxon tribes that settled in the British Isles after the Romans left valued it as cure for scurvy and as a laxative and diuretic. Here in Pennsylvania, the Germans grew dandelion in their gardens and even today the Amish value and use the plant in early spring. Years ago, I too harvested the leaves every spring and served them with an Amish bacon dressing that I devised. As the warm weather persisted, so too did Lyme disease ticks and I continued to pick them off my pants throughout December. Even on December 15 it was 54 degrees late in the day. It rained on the winter solstice and the following day. But it was back to Indian summer the next two days before winter weather finally settled in, at least for a short time. What changes I have seen during my 41 years here on our central Pennsylvania mountaintop. Never in my wildest dreams could I have imagined, back in the 1970s, when autumn began at the beginning of September and ended at the end of November that the seasons would shift and autumn would become the longest season of the year.